Yoan Cardinale // OGC Nice // 22 // Goalkeeper: The Frenchman earned his place in Nice’s line-up only in the second half of the season, after a combination of injuries to Mouez Hassen and a drop in form. His exploits (among others) propelled the side to an unlikely Champions League spot challenge having finished the previous season just six points above the relegation zone. 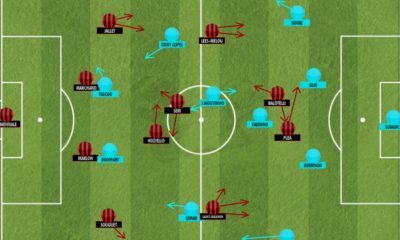 Nine clean-sheets in twenty-five aren’t ground-breaking statistics, but Cardinale did his job well in an overachieving side, and deserves his spot in the XI. Fabinho // Monaco // 22 // Right-Back: Fabinho returns to the Talent Radar Ligue 1 XI having staked his place last season as well. The Brazilian’s ability to defend, something curiously lacking in young full-backs makes him stand out. The 22-year-old has become a regular in Champions League qualification challenging Monaco, carrying on from previous seasons’ successes. Along with averaging six tackles/interceptions this season, the full-back has also managed seven goals having been trusted as Monaco’s first choice penalty kick taker (another rarity for a full-back, of any age!). Marquinhos // PSG // 21 // Centre-Back: The Brazilian returns to the Talent Radar Ligue 1 XI as well, but arguably unlike previous seasons, his place isn’t as warranted as before. While on pure quality, the ex-Roma man would walk into any team, the competition present at PSG means he struggles to get game time and on another level – struggles to make an impression in an already dominating team. Although we include him here, for a third consecutive season, it wasn’t as deserved (for lack of a better word) as the first two times. Nevertheless, part of a record-breaking PSG side, Marquinhos has already won three league titles, five domestic cups and one continental trophy. The career has just started, as useful football accumulators would suggest. 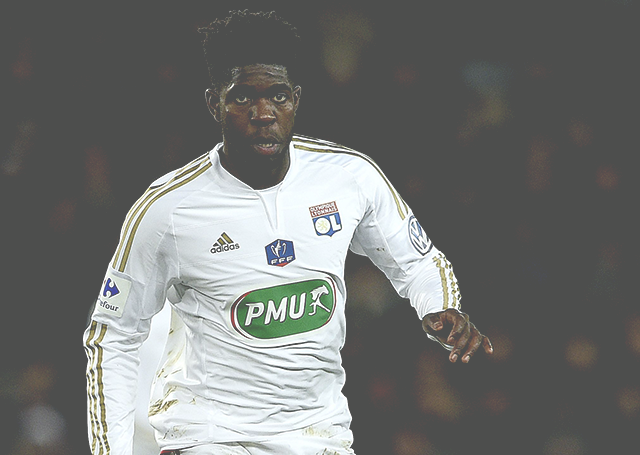 Samuel Umtiti // Lyon // 22 // Centre-Back: This marks Umtiti’s third appearance in the Talent Radar Ligue 1 XI, partnering Marquinhos in each of those years. 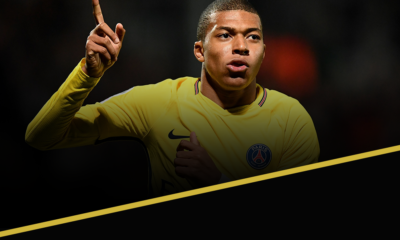 The Frenchman led our Talent Radar Player Rankings for much of the season, and is in contention for the Defender of the Season award at the 2015-16 Talent Radar awards. At just 22, Umtiti has already surpassed 160 first team appearances, and his experience shows in his intelligence on the pitch. An extremely mature reader of the game, Umtiti has been a stalwart for the club for four seasons, having made his debut five seasons back. The young defender has helped Lyon reach the Champions League once again, despite a nervy start to the season. Raphaël Guerreiro // Lorient // 22 // Left-Back: With Layvin Kurzawa, who previously occupied the left-back spot for two seasons, now ineligible for Talent Radar, Portuguese youngster Guerreiro has stepped up to occupy the position. Having exceeded expectations the previous season, he came into the 2015-16 campaign with a lot of expectations. Though one may claim he has failed to live up to the base he created for himself, one cannot question his ability. As modern full-backs go (and quite contrary to Fabinho on the other end), Guerreiro is as modern as they come. With a dependence on pace, and an ability to be used as a winger, Guerreiro has once again shown why he’s highly regarded as Portugual’s next exciting full-back. 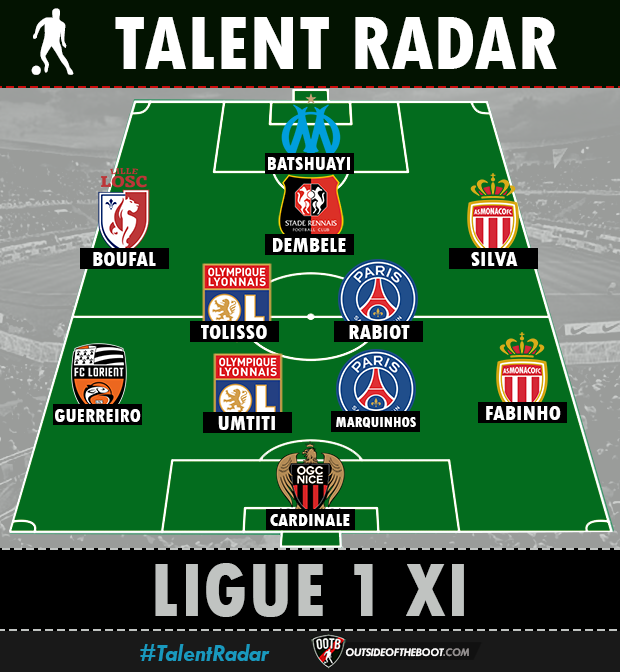 Adrien Rabiot // Paris Saint-Germain // 21 // Central-Midfield: Having started the season with an undecided future, Rabiot finishes it with a place in our Talent Radar Ligue 1 XI. The 21-year-old has enjoyed his best run of games in first-team football, managing 40 appearances with his previous best being 34. Though lacking in physical strength, Rabiot makes up for it in his gaming intelligence. With a capability of playing a solid role in midfield (which shows in his 90.5% pass completion rate), Rabiot has been as instrumental squad player in an ever impressing PSG side. Corentin Tolisso // Lyon // 21 // Central-Midfield: Another youngster making back-to-back Talent Radar Ligue 1 XI appearances is young Tolisso. Like his side, which impressed more in the previous season challenging PSG to the title, Tolisso’s growth has been rather subdued. The ideal man for any side looking to retain possession, Tolisso hits the mark in midfield with his ability to keep the ball for his side. With seven goals and seven assists this season, he has also gone on to prove he has the ability to add to the attacking dimension of the side. Bernardo Silva // Monaco // 21 // Right-Winger: A cheeky little play-maker in his own right is Portuguese youngster Bernardo Silva, who continues to impress in a fairly young Monaco side. The 21-year-old managed nearly double the appearances compared to the previous campaign, making an impressive forty-three appearances for the side. Unfortunately the former Benfica man has only managed to match his season’s tally of seven goals from the previous season, having played nineteen games more. With fantastic control, excellent ability on the ball and swift dribbling, Silva is an exciting youngster who’ll continue to impress in our Talent Radar feature next season. 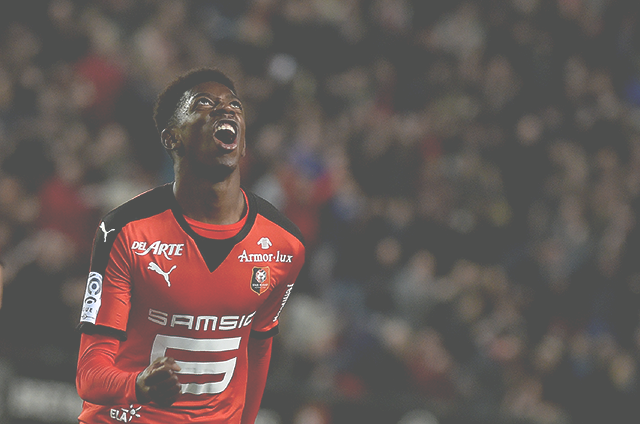 Ousmane Dembele // Rennes // 18 // Attacking-Midfielder: It’s quite astonishing how blessed the French game is with young individuals, and how they continue to churn out top quality youngsters season after season. Dembele is the latest to break onto the scene, seemingly without warning, and continues to take the league by storm having only made his first appearance in the senior team in November. Twelve goals and five assists have followed since then, raising Dembele to a pedestal of undeniable expectations – one which he looks good to meet in the coming months. Sofiane Boufal // Lille // 22 // Left-Winger: Boufal received well deserved validation for his exploits this season, having been named the Best African in France, an award previously won by the likes of Aubameyang, Gervinho and Ayew. With incredibly quick face and unbelievable dribbling ability, Boufal has managed to earn the praise of many as he led an impressive season with twelve goals. But it’s not just the goals he scores, but rather the chances & half chances he creates, seemingly from impossible situations, that sets the Moroccan apart. Lille haven’t been great this season, but the performances of Boufal have left all supporters of the Northern French club craving for more. Michy Batshuayi // Marseille // 22 // Striker: Having started the season in incredible form, one may not fault Batshuayi for being disappointed with only twenty two goals at this stage of the season. Eleven of his seventeen league goals came prior to January 1st, 2016, having scored just six in the league in the second half. 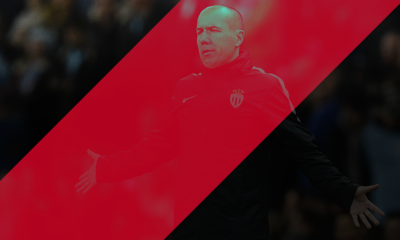 A lot of that had to do with Marseille’s incredible drop in form that sees them just about avoid relegation. But the Belgian can certainly look back on the season with delight, having nearly matched his scoring record in his last season in the Jupiler League that earned him his Ligue 1 move. The 22-year-old has continued to constantly fight for top spot in the Talent Radar Player Rankings.